Holding a Thanksgiving party, or feast, in the classroom is a time-honored tradition in many elementary schools across America. Planning the menu can be tricky, however. Children, especially young ones such as those in kindergarten, are notoriously picky eaters, and may hold their noses at traditional Thanksgiving foods such as cranberries. Try serving them the actual foods the pilgrims ate (fish, for the most part) and they will probably turn their noses up even more. 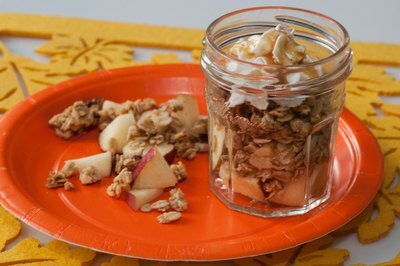 Instead, plan a menu that has some elements of tradition but appeals to children as well. Most kindergarten-aged children will eat turkey, so you should not have much of a problem with this traditional food. You can serve traditional turkey, shredded or cut up into cubes. 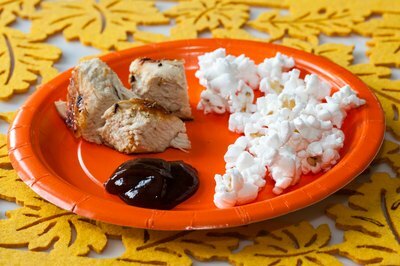 To make it more attractive for young children, you may have to serve some kind of sauce with it, whether it's gravy, barbecue sauce or even--let's face it--ketchup. Instead of corn on the cob, which can be difficult to eat, serve loose corn or even popcorn, which is sure to be a huge hit at your Thanksgiving party. Nuts and dried fruit are food items that the pilgrims ate a lot of, so put a handful of nuts and dried fruit on each child's plate (first make sure none of the children are allergic to nuts). Skip the stuffing or dressing entirely, and served mashed potatoes or even french fries (sweet or plain) instead. For a fun appetizer, serve "cornucopias" (Bugles brand corn snacks). The kindergartners will have a blast sticking them on their fingers. For dessert, serve pumpkin pie (with whipped cream of course) and an apple cobbler for those who don't like pies. Also consider Thanksgiving cookies shaped like turkeys or pumpkins, just for fun. Many young children do not like pie and will probably prefer the cookies. Instead of cranberries, serve sweetened cranberry juice as one of your drink choices, along with milk and water. For easy clean-up, use paper plates and utensils. Ask parent helpers to set up for the party while the kindergartners are outside at recess. 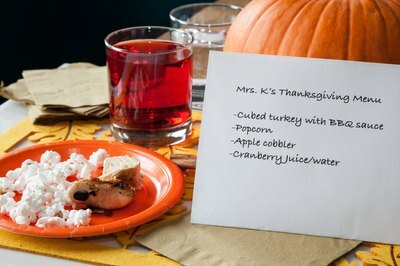 A day or two prior to the feast, have the children design their own Thanksgiving-themed place mats, then laminate them. During the feast, ask each child to stand up and say what he is thankful for. Not only will this cut down on noise, but the kindergarten party guests will thoroughly enjoy hearing what the students have to share.